SOURCE: MOSES OWEN BROWNE, JR.
“During the Ebola outbreak, I was very unfortunate. My husband contracted Ebola, then I contracted the virus from him along with my four children. 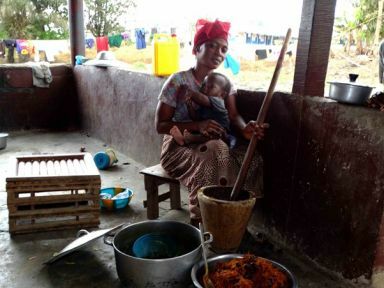 My husband died in August 2014, then my three-year old baby died of Ebola a few days later. It was hell for us. I couldn’t believe we had all contracted the deadly Ebola virus. Our lives were threatened and my little daughter and husband – our bread-winner – died in the process. I was ostracised by my own community and abandoned. People gave me and my children food and water – but it felt like they were feeding dogs. Food was thrown at us. No one wanted to talk to us. We went without food and water for days. I was drained and very ill. Only God saved my life. The Ebola outbreak really damaged the country’s infrastructure, especially the health and education systems. Schools were closed for nearly six months. Hospitals were down. Everything physically stopped during the height of the Ebola crisis and, even though we are now in recovery, the economy has declined considerably meaning life is still hard. I am making ends meet by selling fish. I got a cash grant from Plan International Liberia and UK’s Disasters Emergency Committee for USD $110. I used the money to buy some fish from the riverside and started selling it in the community. The profit is meagre but I am managing to pay my rent and feed my kids. Unfortunately, my children haven’t been able to go back to school as I am very poor and my business is small. For me, the worst hardship is what I am experiencing now. Since the Ebola crisis, I have lost my husband and little daughter and the pain is still rife. My husband was very helpful, he was the bread winner and he was indeed the eye and hand for the family. Times are tough now, so tough that we go to bed many days without food and water. The business sometimes does not sell anything at all. The Ebola outbreak has also affected me health-wise too. My heart hurts me almost every month. A local NGO provided some medication when the illness started, but since August 2015 we are without. Our community is slowly starting to rebuild itself thanks the support of organisations such as Plan International and others. All my belongings, including clothes, were burned when I contracted the Ebola virus. While members of my community shunned me Plan International supported us with clothes, mattresses, and food and non-food items. Even though every day is a struggle, hope is the only thing I have now. I hope the future will be bright. I hope I will be able to send my children back to school. I hope to start a business that will pay my rent on time and put food on the table for my family. After all, I am now the head of the family. My husband has gone, which means I am the breadwinner so I have no choice but to assume that role. We can’t forget about what’s happened over the past two years. Liberia has been declared Ebola-free three times since the first outbreak and we don’t want another case to occur. Our community is still working with Plan International and other NGOs to raise awareness on Ebola through the use of community radios in Bomi. We use megaphones to educate our peers on Ebola and importance of education and we distribute flyers with educational messages about Ebola. As part of Plan International’s two-year recovery strategy in Liberia, the organisation is supporting the recovery process by providing hygiene kits in schools for safe schools, training teachers on safe school protocols and building resilient communities. Plan International is also supporting communities with the construction of safe drinking water sources in villages in Nimba, Lofa and Bomi, as well as constructing three modern schools in Nimba and Lofa to benefit more 3,000 pupils. The aim is to rebuild community resilience and support communities affected by the outbreak to regain life.